Saba was born in the Great Rift Valley in Kenya on the 7th June at 7pm on the seventh day of the week, and became the 7th grandchild in the family. Her name means “seven” in Kiswahili. 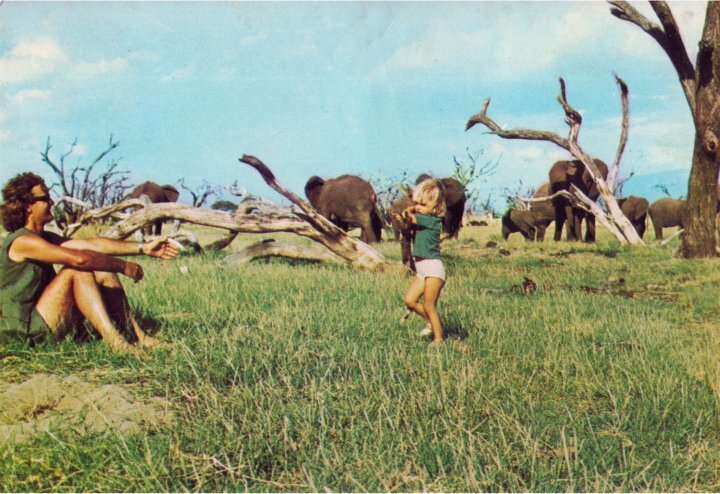 When Saba was six weeks old she met her first wild animal, an elephant called Virgo who was one of approximately 400 elephants that her zoologist father, Iain Douglas-Hamilton, was studying in Lake Manyara National Park, Tanzania, for his DPhil. Virgo had a single right tusk and at eighteen years old hadn’t yet learnt to be afraid of man. Being both inquisitive and rather friendly it wasn’t long before she became habituated to the researchers and would walk over to greet them when they called her name. On Saba’s first meeting with Virgo, her mother, Oria, approached the elephant on foot holding her newborn baby in her arms. Virgo let them come close then stretched out her trunk and took a good long sniff of the baby. She then coaxed her own calf forward as if to introduce it to the humans. A year later Saba’s sister, Mara, was born. The children ran wild in the African bush learning bush-lore from the rangers and absorbing all there was to know about elephants. Kiswahili was their first language and they hardly ever wore clothes. At seven years old, Saba went to school for the first time in Nairobi. Later she attended the United World College of the Atlantic in Wales, and then the University of St. Andrews in Scotland from which she graduated with a first class degree in Social Anthropology (MA). Saba’s first job was with Save the Rhino Trust in Namibia, working in the hinterland of the Skeleton Coast on a Crafts for Conservation project. She was then head hunted by the School for International Training to work as an academic director in Tanzania, and later did a stint as an anthropological consultant for the National Museums of Kenya. 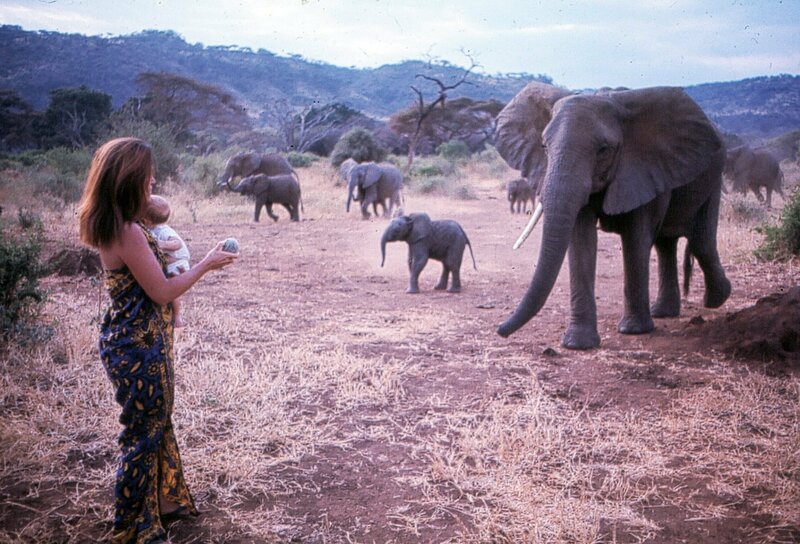 In 1997 Saba joined her father’s charity Save the Elephants (STE) as Chief Operations Officer to help build up their research center in Samburu National Reserve, north Kenya. It was here that she was talent-spotted by the BBC and began her life as a TV presenter and producer of wildlife documentaries. Saba lives in Kenya with her husband, Frank Pope, and their three young children, and currently runs the family’s luxury tented eco-lodge, Elephant Watch Camp where she is pioneering the concept of “conservation tourism”. A 12 part BBC series – This Wild Life – has been made about their lives in Samburu, which is showing in the UK on the BBC and on PBS syndicated channels in the USA. Hello Saba, Wishing you in advance many many happy returns of the day. A very happy birthday. (7 June). I watch Animal planet regularly. You are doing a fantastic job. What baffles me is why you go barefoot.in the wild.!! May god protect you & your family. & bless with all the happiness. Good Day, Saba, not sure if this is still a way of making contact, My name is also Frank Pope, originally from Scotland, came to Canada’s Arctic at 17. I am interested in communicating with your Frank Pope, for a discussion him on Elephants and me on Caribou (Mountain, Barren Ground and Boreal Woodland) and other arctic and Northern Taiga specis such as Wolves. Hi Saba, Frank is an extremely lucky man. You are an admirable woman. I helped to have hare coursing banned in the UK and used the media as you do. I climbed the north face of the Eiger solo to raise funds for our struggle. May I wish you well in all you do. Looking for your email address to write you a letter. I James Haverly 47, single never married and no children wanted to see if you needed free help in the Bush as they say. Love to life my life dream by seeing the worlds best kept secret. If you have time to listen to my story please let me email you sometime. May you and Frank as well as kidos have a blessed 2017 keep up the great efforts you all are doing for the Elefents and the community. Hi Saba ,just to say that your talk on Monday 1st April in Worthing was amazing and very inspiring. I have supported an elephant charity for someone time and meeting you after the talk on Monday made the evening very special. I’m Madalyn Gaffney. At school I’m doing a recerch project about elephants. I was hoping you could maybe answer some of my questions. Hi Madalyn – have a look at http://www.savetheelephants.org as I’m sure you’ll find most of what you need there. Best of luck! Have you ever thought of creating a program to drill some dye into the tusks? I know this would be a big job but it would save so many. Is this even feasible ? The idea of dyeing or cutting tusks has been circling around for a while. It might work if you were dealing with a few elephants in a small reserve, but not on 450,000 or so elephants across the wilder parts of Africa. Economically and phyically impossible as each would need to be individually darted. Cut tusks grow back, besides which one can only cut above the nerve which is half way along, still enough ivory to tempt poachers. And dyeing tusks is like trying to do the same to teeth. Can be scraped off the surface. I don`t know if you longer read your blog. But since learning about you and your work via Animal Planet, I have become more aware of what is going on regarding hunting, poaching, and slaughtering of the wonderful elephants. In the beautiful continent of Africa. It grieves me constantly to read about what is happening and how difficult and complicated it is also to embark and solve these problems. I want to thank you for the work you do (Thank your father also!) and also that you constantly inform all of us living so far far away about what is going on. It is not easy to get involved when living completely on the other side of the world. BUT, still I feel very saddened by it all, it really affects me, can`t even comprehend the difficulties when living in the midst of the conflicts. It must be very very challenging. I am reading your Facebook site regularly. I have a female cat, who is now 4 years old. She is a typically Norwegian forest cat, but has short hair. When she was born, I thought immediately she looked like a Cheetah. The colors, the distinctive black “tear stripes”, the long slim muscular legs. I just thought she looked like one. But then I remembered you, in Africa, barefoot, looking at the beautiful Leopards in the trees. Well, so I called her Saba instead. Hi Saba l am Dr. Gagan from India. I am great fan of you. Please tell me the best time to visit Masai Mara to see wilderbeast migration. My name is Kelli Henrikson. I have kind of a long story but bear with me. I have loved Elephants since I was a little girl. I bought your father’s book “Amoung the Elephants” & just loved it & still have it somewhere in a box (hopefully). Years later I was at the dentist’s office & was waiting & picked up a Nationl Geographic magazine & there was an article on your father & mother. There it was the picture of you as a baby being held out to (now I know from above) Virgo (which may have been mentioned in the article). I was just thrilled & started crying. I asked the dentist if I may keep the copy of the Nat’l Geo & told him the story. He said of course. (I better also still have that in a box as well). I had seen you doing the shows of the Cats occasionally & never put things together until the show where the female lioness adopted the baby oryx. I was just in awe, that the baby I had seen so many years ago in that magazine, had grown up into such a beautiful & successful woman. Your family has inspired my all my life (even though not going as well as planned) but I was able to work & help run an Exotic Animal Refuge here in Colorado & work with Lions & Tiger’s & Bears oh my…..it was the best job I have ever done & grateful for being able to do it. My dream has always been to come to Africa but life doesnt always go as planned. It is important work that you & your family & so many others do I just wanted to Thank YOU because your family has been an inspiration to myself & so many others that havent had the opportunity to travel to such a location as Africa. If I can find that Nat’l Geo magazine I will somehow send you the picture, if you dont already have a ton of copies already. Thank you again for the work you do, it does matter all across the World, REALLY it does! Hope this message finds you well! Apologies in advance, I wasn’t sure about the best way to contact you, so I’ve also send a message to your Facebook account! My name is Brianna Albert and I have been truly inspired by your story. Your background, experiences, involvement with various conservation efforts, and career are both incredible and encouraging as a fellow animal lover. I’ve been reading up on the conservation efforts that you are involved with an I believe that they are absolutely amazing efforts. You seem to be genuinely passionate about what you do and make a wonderfully positive impact on a daily basis. year to work full time at two animal sanctuaries (with a wide variety of domestic and exotic species including sloths, coatis, wolves, koalas, dingoes, etc. etc.) and would love the chance to continue working with animals and improving their general well-being. Do you have any general advice for someone looking to follow a path similar to your wonderful one? I would absolutely love the opportunity to help you, any conservation efforts you’re involved with, or the animal kingdom in general in a more hands on way! If there is anything at all I can do, please do let me know! I very much appreciate you taking the time to read my email in general. As mentioned, your story is truly an inspiration! Thanks so very much and have a great day! I totally admire this amazing woman. I admire the who family. Wish I could b like them. hi Saba. I live in Los Angeles and am very touched by the work you do. I used to live in Johannesburg South Africa and Durban. How can I keep in contact with you just to send an email ofencouragement to you and your team now and again. And possibly get some personal updates from you. Hi John, thanks for your lovely comment. We can send you the monthly Save the Elephants newsletter which is awesome! Send me your email and I’ll put you on the list. Hi Saba, all this so interesting! Kindly put me on the list for your monthly newsletter please? I live in Bryanston, Sandton, South Africa, am crazy about wildlife conservation and anything to do with the Afriican bush. So hoping that The Wild Life programme to which you refer is flighted in SA some time…..never caught it…. So hope to visit Samburu one day. Thanks Saba. You were my inspiration to go to Samburu Reserve! Wonderful! Come back again and visit Elephant Watch Camp. And keep your eyes open for a new series about our work called This Wild Life, showing now on BBC2 in there UK. I am amazed by your surname which is similar to mine, does that mean we are family though you are white and originates in Kenya, while I am black and South African? Actually my first name is Saba and my surname is Douglas-Hamilton … but that’s a fun idea that we’re related! Which part of SA are you from? Good to hear from you indeed its a fun idea that we are family. Sharing names and (1970) year of birth makes it more interesting. I am in Pretoria ZA. Please invite us to Kenya, my wife and I will appreciate it. Thank you Charlene! Hope you’re watching our latest series – This Wild Life – about our work in Samburu. It’s showing now in the UK on BBC 2. Will be coming to the States soon. Just watched on PBS re- run for the first time. I love the way Saba loves elephant and puts so much in the conservation. Great to read about you.Interested to know about the people and wildlife of Africa. Thanks. Hope you’re able to access our latest series – This Wild Life – about our life and work in Samburu national reserve in Kenya. Showing now on BBC2 in the UK. How can I watcth your series in India. I am interested in visiting Samburu to see the big 5. I was wondering where I could book to visit your camp? Saba- my son Bodie (5) and myself love watching the Nat Geo episodes on STE. He has so many great questions and such compassion for wildlife. Your show has allowed him to see the elephants in their natural environment. Thanks for your lovely message which makes me very happy to hear. You son Bodie clearly has his heart in the right place. Delighted that we are able to fuel his passion. Please keep an eye out for our new series This WIld Life which is currently premiering in the UK. Am not sure when it will be coming to the States, but I’ve been advised that people who are not in the UK and thus unable to access iPlayer can download the “Film On Television” Application on their iphone or ipad and tune in to BBC 2 and enjoy at the same time as everyone else. Saba and your young family are wonderful and a real credit to the Human Race…My Best wishes. Hello Saba, it is wonderful to receive feedback from you and to discover there are people such as yourself, your family and the lovely group of people you have there who are doing such difficult yet important and inspiring work…perhaps there is hope for our beautiful planet yet. Couldn’t help but smile as you said “i’ll kill those monkey’s” after discovering them stealing items from the vistor’s tents. I had not realised it was so up-to-date and a premiere (thank-you for this), i’m now very much looking forward to the remaining episodes. It is a truly a wonderful Planet we have been blessed with and it’s heartwarming to know others think so too. Ive been so thrilled watching This Wild Life!. Ive always followed your programmes and have great admiration for you and what you do!. I have always wanted to come to Africa and i love animals especially Wild cats and Giraffes!. Im Giraffe mad!!. It made me cry at the elephant you watched all night and then made sure the calf was ok. Your a wonderful lady Saba, and your staff at the camp are lovely people. Bernard makes me laugh! !,,can you give him my best wishes?. What a caring man!. I love his tribal adornment,,so colourful!. Saba keep doing what your doing,,this world and animals need people like you so badly. It looks so beautiful out there and i hope i get to visit one day. All my warmest wishes are sent to you and your family and staff!!. Thank you Rosemary, for you kind and heartfelt message. I hope we get to host you one day at Elephant Watch. What is the story behind your father giving the Tyrone sisters their name? Torone means “shrill queen” in Greek. They were a family of extremely ferocious elephants that would charge every time he came across them. They once all attacked the vehicle at the same time and made liberal use of their tusks in transfixing the vehicle. Both my father and his ranger were unhurt. I misspelled Torone. How embarrassing. On a happier note, I finally found my copy of Among the Elephants — buried in a box since a move long ago — and there was your father’s explanation of the Torone name on page 64. Thanks for the correction. Dear Saba, it gives me immense pleasure to watch your episodes, adventures, research and dedication to your project. Needless to say that only because there are very few, rare dedicated legends like you in this field, people become aware of importance of nature and environment. It would be the happiest moment for me if I get to talk to you for a few moments, receive correspondence from you and if I get to work with you even once in the lifetime…. my all best wishes to you for your career, personal life and best, warm regards to you, Saba. I’m feeling very happy and proud for getting to write this to you. I am working with Mahindra Group of Companies, who manufacture jungle vehicles often used for research work like you do. My personal email id is abhay.dhamanikar@gmail.com and mobile phone number is +91 9921772233. Thanks and best regards again, Abhay Dhamanikar – India. Thanks Abhay! Lovely to have your support. thanks Abhay. I believe we are already in touch on FB. Thank you Catherine – it means a great deal to all of us to have your support. Hello Saba, my husband & I watched all you 10 series’s at least twice. Absolutely amazing work you both do. I too am born in Kenya & feel closely connected to the landscape. We did Safari in 2004 with A&K & had the most amazing experience. We would love to come & see the work you do ! What an amazing work you do. You seem very passionate about the Save the Elephant Project. Charles & I watched all your 10 series’s on BBC 2, just wonderful ! Perhaps some day we can come & see the work you do. I too was born in Kenya & feel so connected to the landscape & the conservation work you do. Thanks Neeta. Hope to see you out there someday! It was interesting to see that the brilliant BBC decided they needed to add subtitles at times when then superb David spoke (he actually speaks English better than most here in the UK) and the way he informed those in power towards the end about the elephants plight was truly brilliant. I learned a great deal….That Elephants need to feed 18 hours of the day and that it takes up to 6 months for baby’s to use their trunks properly. MATT (the 40 y.o.) Elephant is magnificent and I hope the heroic Frank (I can’t believe how courageous both he and the team are) and this team can keep those poachers away from this incredible creature and all the rest….maybe the message will hit them finally one day. There is story I remember hearing…it stated that an elephant was mistreated for years within a zoo by a vistor and that many many years later it had remembered him and when he returned for a vist it swiped him with it’s trunk 🙂 I understand elephants have incredible memories? 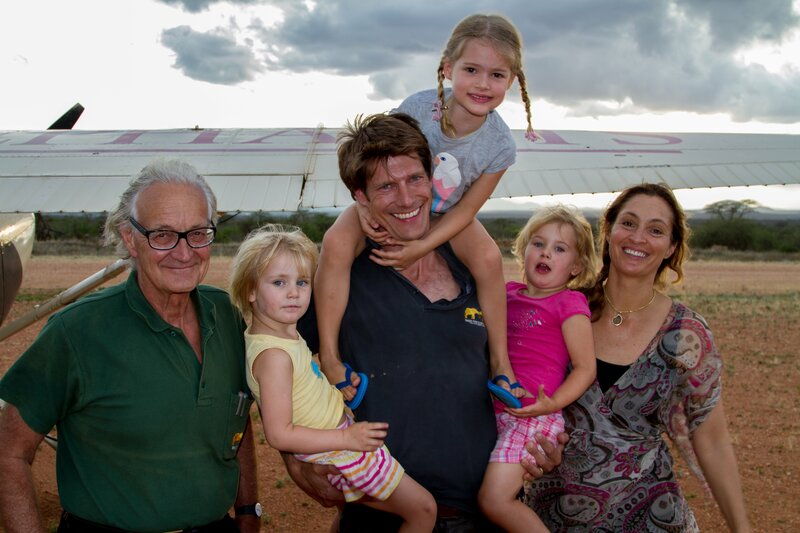 So, Saba, Frank and the kids first season in Samburu ends…and it looks like it was a huge success but I hope this doesn’t mean the BBC will not return for at least one more season as I’m sure there is more to be learned. I’m confused I thought I already had left a reply!! Hi Saba, I was on the farm at Naivasha for a few months when you and Dudu were young! I don’t have much money but I do have some IT skills – I sat under a fever tree with the first ever computer printout to pay the workers on that farm! I flew over the farm with your mad dad to take pictures of the fields to work out where to spread extra fertiliser! When I had shot the whole roll of film he put the plane into a spin to lose altitude rapidly! My face was plastered backwards and out of the corner of my eye I could see the wings bending upwards from the G forces!!!! I am retired now (my aging accelerated from my time with your dad) but I am working on my memoirs http://www.wheresolly.com/david.html blog at the top of the page and a very cute, free ClustrMap at the bottom – would be good for your site too Please let me know if I can help! Really looking forward to This Wild Life! Wondered about having Julian Rhind-Tutt on the programme. How was this, given he is a pretty funny guy? I wondered, if you know is there an official fan base that he has, that you could direct a big fan to?? My name is Nell Gifford I am the daughter of Rick and Char Stroud who were friends of your parents in Oxford in the 1970s …..
You are such an inspiring woman, beautiful inside and out. I think the work you carry out is incredible. Please tell me is there anything I can do from the “wilds” of Essex in UK to help your charities? Also how can one help out in the reserves or stay and help (even as a holiday) in ne of the lodges or reserves. Hope to hear from you, Lynne Harrington. Hi Saba, my husband and I always watch your programmes. We think you and your family do great work. I see you are in various parts of the U.K. and though I’m from London, I have just moved to Norfolk and unfortunately you are not visiting any venues here. Is there any chance you might be? Not this time round, but I hope there might be a venue close to you somewhere?? I have left a message for you on FB. I understand a friend of mine sent you two of my pictures taken at galana last week, of a quite remarkable Ellie we spent 8 hours with, in our camp. We are coming to Salisbury on the 22nd April, and I would love your take on his strange but wonderful behavior. I have some fantastic photos, it’s taken us 10 years to finally get to see something so truly magnificent. Hi again. I’ve since had an email from Angela Sheldrick who has confirmed he is a DS orphan, probably explains why he was so comfortable with us, but a bit worrying. . .
Ah! That explains it! Yes, it is a bit worrying. Something the Sheldricks will likely have to resolve at some point. Hi Saba, I see that you are coming to Tunbridge Wells. Right on my doorstep. It’s been a while since we both last were in touch. Much stuff happened to prevent me keeping in touch with you but I keep up with all your adventures. Is there any chance we can meet up when you are in Tunbridge Wells? (I do note that you are not here for long!!) I would love to see you. Hi there J – great to hear from you! Will you be coming to my talk? If so, we can probably have a quick drink afterwards or something. The interval always tends to be rather frenetic so not the best time of catching up. I’d also hugely appreciate some help spreading the word. We have an ENORMOUS venue to fill! Any local press or word of mouth networks you can think of who might be interested?? You are a STAR! Thank you! Internet here in Kenya is abysmal, which is why I’ve taken so long to reply. Apologies. Done! Let me know if you get it. Dear Saba I loved your programme you do such good work. I was wondering what time of year we can stay in your tents, and the cost please. Thank you Saba I have e.mailed Catherine. Great to hear all this and you should definitely come back to Kenya! Dear Saba, firstly you are an amazing woman to have devoted your life to wildlife conservation. My husband and I had a fabulous safari holiday in Kenya some years ago we visited Samburu so keenly watch your to programmes. We are looking forward to the evening with you in Taunton and know it will be a great evening for all. Once again bless you and all your family for being passionate about Elephant conservation. Wonderful that you will be coming to my talk! Next time you come to Samburu you should think about staying at Elephant Watch. It’s simply magical. Yes I got it Martine, thanks, and good to hear from you. It’s wonderful that you are so passionate about wildlife and I hope you make it out to Kenya someday to Elephant Watch Camp where we live. Hello Patti – got your message and am trying to see if my agent can get you some tickets! How many do you need? Is it 3 or 4? Dear Saba, My name is Moheb from Islamabad/Pakistan you are a great women working for wildlife i love your documentaries i am my self wildlife activist in Pakistan please can you tell that from where or how i can buy your books because they are not available in Pakistan and i would love to read interesting stories..
Saba I am very delighted to read your biography as an enthralling conservationist for the elephants i love so much, continue with the same spirit I would join you. I am studying biological science and I am ready to major in wildlife biology. i hate poaching of elephants and rhinos so much that is why i decided to study biology to come help conserve them. It is wonderful to hear of your passion – and I hope that you’ll join the charge to save our amazing wildlife! Thanks Moheb – I’ve been trying several times to answer you but have had trouble with the Internet. Am now in London so it’s all working a bit faster! all done and dusted – you star. Saba, Please can you tell how i can get your books because they are not available in Pakistan….. Thank you for the work you have been doing and continue to do saving the elephantspirit Watched you on PBS. Thank you! please join hands with us at Save the Elephants to help secure their future. Saba did you got my message.. Yes I did, and I answered. Did you not get it?? I have been saddened to see the repetitive behaviour of animals in Bristol Zoo. For example I’ve seen this with Lion, Sand Cat, Sea Lion. The zoo keepers appear to be in denial when I politely challenge them on such. Like they’ve be trained to reply with a party line. I am thinking of starting a campaign to close Bristol Zoo as we know it, to change it to conservation only – so any creature that does not need to be there, is not. Do you think keeping animals to be viewed for the entertainment of people is OK? Animals that don’t need to be there but are there to bring the punters in, to get the money in, with the defence / the argument that the money goes to good causes – conservation etc..
I.e. do you think it’s OK for us to enslave animals, driving them mad (repetitive behaviour) to make money to apparently (though I question how much is going directly to the right places rather than into human pockets) to pay for the conservation of other animals? Bristol Zoo prides itself on it’s quality and will always say that the animals have enough space etc.. However the behaviour of some of these animals is there for all to see, anyone that spends long enough watching them rather than laughing and pointing, enjoying the entertainment, will see just how messed up these animals are. So if the behaviour of some animals at Bristol Zoo is a fact and it’s a fact that the staff appear to refuse to acknowledge this, let alone acknowledge that such a behaviour is a problem, shouldn’t one start a campaign? I don’t know where the Sea Lions come from but just because they were saved, if they were saved, or just because they weren’t bourn in the wild, if they weren’t bourn in the wild, logically does not therefore mean one has a right to condemn them forever to mind numbing boredom where they must endlessly and repetitively swim in precisely the same way, passing key markers almost second perfect again and again, who knows perhaps for the rest of their lives. So who knows, they could have been doing this for at least five years pretty much non stop. Forgive me but I urge you with your influence to stand more clearly on one side of the fence. Do you think one should campaign to stop it? It would be great if you could publicly and clearly state that: if animals are behaving in this repetitive way and the zoo is not acting then one should campaign to stop the zoo from causing this behaviour in animals. If high profile people such as yourself won’t clearly state such then how can one expect Zoos to change the way they treat such animals? And how can one expect the public to care more about them? Just listened to you on Radio 4 and its inspired me to book a ticket for May 3rd. Looking forward to learning more about elephants and your family life in Kenya. Wonderful Nina! Delighted to hear it! Bring some friends along too – it’s going to be a great night as it’s my last talk so should be the climax! I cannot believe I am going to miss your talk tonight due to a stye the size of Mount Kenya. ..I am so disappointed and just hope you will come back next year. Will you please add me to your mailing list for your monthly Save the Elephants newsletter. I wish a wonderful evening. Hi Saba, thank you for your reply. Sadly, Season 1 of your series just ended on French tv ! It just carried me years ago back, when I first discovered Kenya. Luckily, I found out more on Bbc Youtube. Indeed I look forward to be able to come over to your camp one day. (I’ll enquire to your headoffice for practical/admin venues). I had always wanted to discover northern Kenya, having done all the tourists itineraries in Kenya and Tanzania several times, a passion since childhood. Samburu is so rich for its specific fauna, nowhere else to be found. It is true that lion there are smaller than plain lion (Adamson’s Elsa was of that type, in Meru). Your camp seems so unique with these wonderful beasts around. One does not approach elephants so close in other places. I wish to live again the magic of the african nights, the smell, the sounds, the shadows of little dikdik or buffalo coming in. All reminds me so much of memorable encounters with wild animals in the bush: Mara, Serengeti, Ngorongoro, Manyara, Tarangire and so on..And all reminds me so much of Schaller, Kruuk, Van Lawick, Leakey, Scheldrick and so many, such as your parents who devoted their lives to wild animals. I had Bodicea framed in my office for many years in the ’80s. She was such a beautiful elephant and the symbol of an endangered specie. Again, congratulations for the works you, Frank and your father do with so much passion and devotion to try to preserve these gentle, sensitive, so intelligent giants. Poaching has become a major threat for most species all over the world. That terrible world of corruption, terrorism and wars we live in, where survival of the wild conflicts with human interests. I believe most species are doomed to extinction due to explosive demography, destruction of migratory routes, natural habitats, exploitation of animals, poaching and traffics. Should we really want to see the last specimen in zoos or stuffed in Natural History Museums leaving no legacy for those who comes after, is there any more room for wild animals .. Some species have become extinct only recently on the scale of mankind. Can you tell me where Yeovil is? I’m afraid I have no idea. Dear Saba, Just have to let you know how exited I was when, driving home, from a friends, heard on Radio Devon that you will be in Exeter. I stopped the car to listen to you talking to the disc jockey. I had to stop, because radio Devon falls away while driving, and I would miss part of it. When you told about all the Elephants you had as a child,I thought, I wonder if she can beat me in the amount. I have Elephants in all sizes, lots of soft toys as well. Every time I find a book about Elephants I buy it and often I find out when I get home that I already have the one I just bought. I am Dutch and 83 now, live In England and still have all my Elephants. Lorenzo and Mirella where our neighbors and would often come for Sunday lunch with their 2 girls. I met your mother when we did an advertising film for Philips Radio, I was on the boat pretending to be interested in the radio and your Mother was on Water skies. After the boat we had a barbecue on Mirellla’s Lawn. Also later when Princes Lee Radzeville stayed with us. I just want to tell you one more thing. In 1970 I was transferred back to Kilaguni Lodge in Tsavo West. I observed 2 things things that I want to tell you about One was a Jackal. Kilaguni has a smaller round watering hole. That early evening Elephants where standing in a tight circle drinking, when a Jackal past. He walked up to the circle of Elephants and nipped one of them in the ankle, the Elephant shook is foot and went on drinking. But by the second bite he pulled out and chased the Jackal away, but as soon as he was drinking again the Jackal went back. It took a few chases before he gave up. Another early evening an Impala male with a big harem, had just got the ladies all together when a Jackal chased write through them and the Impalas where all over the place. The Male got them together again, but the Jackal did it a second time before leaving them alone. I don’t know how old he or she was. But the second one was very young. Mother Elephant was enjoying some salt, with the little Elephant next to her, at our salt lick, perhaps 8 meters from the Veranda. The Older animal kept on bothering her. The mother Elephant picked up a small stick lying there and hit the older Elephant with it until he wend behind her and stayed there. I just could not believe what I saw. I have been following your life on the telly, and remember when you went looking for Virgo and you could not find her. Can I be very honest, I have been so jealous of you being able to be with Elephants all the time. I was in Samburu National Park in 2011, but probably because it was the rainy season we only saw 1 Elephant. But we saw a lot pf animals and a beautiful leopard lying in a tree, and one that had just killed a buck and was lying in a dry riverbed and just started to eat it. We stopped for the night also at Kilaguni Lodge, but there was not an Elephant in sight, while in 1967 and 70 there where a lot. I remember lying in bed I just loved it when Elephants walked passed and their rumbling tummy would wake me up, or just listening to the Hyena’s at night. I hope I will be able to come to Kenya once more, I wish you and your Family success in keeping the Elephants for Future Generations. Sorry for the long article, but memories flooded back. Will try and be at your talk on the 18th in Exeter. Lovely to hear all of this and I hope you managed to get to my talk in Exeter! If not I’ll be back in the UK in Nov 2017 doing another tour. Hope to meet you then. Sorry for the delay in telling you that I managed to come to your talk in Exeter. Seeing the pictures and listening to your talk, made me long so much to be back in Kenya. Perhaps you remember I asked you if I could buy the large photo of the baby Elephant hanging behind the table. Hi Louise! Just to let you know that I’ll be back in the Uk on tour in November. Dates and venues are on my website. Would love some help spreading the word! hello, regret very much can’t come to uk to attend lecture; can it be seen later on youtube or on your website? Unfortunately it’s not streamed anywhere. I’ll be back in the UK in Nov 2017 doing another tour if you’re interested to come to that instead. Hello Saba and thank you. For those like me who cannot follow all BBC Earth wildlife series on their domestic tv and are following Saba’s & family’s work, I recommend YouTube where there are plenty of documents, interviews and super films on elephant, lion and so on..Also, some rare interviews and films of pioneers conservationists, ethologists, scientists who studied in many places of East Africa. Really great, awaiting to return to Kenya ! Hi Saba, loved your talk at Taunton last night – Inspiring. It would make a great TED talk for a global audience? Thanks Mark! Aren’t TED talks supposed to be 15 mins?? Thank you so much for the evening at Tunbridge Wells. It was nice to be able to say hello after commenting on Facebook for so long. I really enjoyed hearing all the stories I have read in your parents books and seen on TV from you in person. It was also good to hear all about your conservation work past and present. I love Samburu, and although not staying with you, am really looking forward to returning again for a week next month. I have been following your (and others) wonderful work with wildlife for many years. The situation is encouraging … if a little depressing at times … but good for you and your family with ALL that you are doing. My family have all seen and heard you talk in Tunbridge Wells. They LOVED it. I live in Bristol and alas you have not been down our way though I happen to be in Scotland for a wedding this week and see that you are speaking in Aberdeen on Sunday night. I will happily drive the long distance over the mountains but dammit, you are Sold Out. If there is any chance of getting a ticket somehow, I would dearly love to come and hear you speak and continue to support you and your family in all you do in caring and protecting these amazing animals. Travel safely and keep up the good work. Hi Sarah – apologies have only just seen your message! Sadly Aberdeen was absolutely chockablock. They even oversold and had to add an extra 20 seats! But am sure I’ll be back next year on another tour and will try to have Bristol or nearabouts in the Loop! Thanks for your support! I hope this finds you well. I am a wildlife artist and writer on natural history here in Shropshire. I have been a great admirer of you and your work for many years now, and grew up watching Big Cat Diary. I saw you were in Shrewsbury a few days ago and was very sorry to miss you but was away; I hope the lecture went well. I have been lucky enough to travel to and around Africa several times in my life and indeed my wife and I have a small humanitarian and environmental charity out in Tanzania, run mostly by the wonderful Tanzanians themselves, with our head being a Masai of the Arusha area (Monduli). Anyway, I have been trying to use my artworks of late to raise funds for projects by wildlife charities such as the Cheetah Conservation Fund David Shepherd and Elephants for Africa in Botswana (Dr Kate Evans). Most recently I painted a couple of pieces for the DSWT at their event in London with Dame Daphne, which was another honour and helped raise over £5,000. Is there any chance I could help Save the Elephants in a similar vein? Your family’s name has been part of my association with Africa since before I can remember (Iain is one of my Mum’s heroes!) and it would be lovely to help your wonderful charity and of course the Elephants themselves. Many, many thanks and good luck with the rest of your tour. thank you Ben – that’s really great that you want to help! Could you contact gemma@savetheelephants.org who is in charge of fund raising? She will have all the best answers and ideas. If you havea newsletter, could you put me on your list please? Love your work, and hopeto be ableto vivsit one day. Keep up the good work, you and your team are doing a wonderful and worth while job, just amazing!! I live in Madhya Pradesh, India. It is a land of tigers, specially white tigers. I shall be delighted to meet you if you plan to visit India to see these animals. Thanks Dr. Gagan Contact no. 9826298769. Thanks Nina! Have sent your email to the STE team again to make sure they’ve got you on their list for the MT. Hello Saba, I am V S Mani Iyer from Baroda, Gujarat, India. I have seen “The heart of a lion” several times. Incredible. I feel I am closer to God. Saw the episode again today. If U ever come to India Pl come to our home in Baroda and have lunch/dinner with me. I ve great love for people like U. My number 0919727746266. Today I watched the episode in which the lioness of Samburu adopted an oryx. It was really a touching and sensitive incident. I am very curious to know whether you spotted her again? Is she still alive? You are doing a great work. Hope to hear from you soon. We spent a whole year following her but then one day she disappeared and we never saw her again. I think that life as a solitary lioness was just too hard. I saw you in person in Morecambe the other week, and was fascinated listening to your story. I wondered if you have ever written a book. Also I bought a signed poster that night, I wish now that I had got the charging elephant one. Is there anyway I can purchase one signed by you now. Hi Janet – Yes we still have some copies of the Boadicea print left over. If you send me your email I will pass it on to my agent who can send you one from the office. The cost including postage is GBP 28. Been seeing your programs for some time now.Great work. I got a dormant animal NGO of my own. I live in a remote area of Pakistani Salt Range. There are a few species of felines here,yet unrecognised -locally called Palra and Barida. A few sightings etc. by the locals but due to the difficult area no photographs yet. Anyways good work and keep it up.Regards. I just finished watching Baby Elephant Rescue on a local station here in Chicago and was really impressed by what your doing for the elephants. Just recently Ringling Bro. Barnum & Baily Circus here in the States finally retired their elephants after pressure from animal lovers and they will no longer be part of the circus. Keep up the great work and maybe I could visit the Watch Camp one day. Sounds like a exciting time. Or you can book directly through our website. Still open? and if so how do I go about making a booking? Hello Neil – if you write to Catherine at reservations@elephantwatchportfolio.com you can book with her direct or also do it through our website. Hi Saba, my three daughters were spellbound by This Wild Life. Would you add my email address for any literature on your work please? We might visit you from Ireland? Have sent your email to our team to sign you up for STE’s Monthly Trumpet. You’ll get lots of information also from our websites http://www.elephantwatchportfolio.com and savetheelephants.org and you can check out what we are doing on FB! I love your show, I hope there is more to come. I am envious of your passion!! Fascinating life and amazing to see the elephants, can’t get enough. This is Arvinder Sodhi from India. I have studied English Literature throughout my life. And my ideal writer is Sir William Wordsworth, the greatest bard of Nature. I consider nature my closet friend. Nature and Literature are inseparable. I really love the way you and your dad are so much attached to the Nature and Wildlife. I just want to say that thank God people like you still exist in the cosmos. You are even very nice to local people too. I was just watching your documentry about Black Rhino in which you were surrounded by a lot of Black rhinos. It was so beutiful. They were really like butterflies of the night. I would like to write some poems for you but before that i would read and know more about you and your emotions towards nature. I would like to know more about your emotional attachment with nature and wildlife. Thank you Arvinder. What a sweet message. I’m Qamar Wanjiku, in Nairobi Kenya. And I’ve just been browsing your Elephant Watch Portfolio . Its so beautiful, and marvelous . The story of how you met Virgo, is so touching, and your whole life in the wild. I’m honestly pretty jealous, and I wish I had been born in such a family. Wonder how awesome it would’ve been. Quite astonishing that I’ve never even known that we have so many private organizations taking care of our heritage, and I’m sure only like 2,000 of the rest of Kenya know this. With all the poaching of wildlife and encroachment of their habitat, increasing human – wildlife conflict, I think we, especially in Africa need to be the number one protectors of our wildlife. Its amazing how stupid human beings can be, in exchanging a healthy 60 year old Tusker for a few trinkets and idols. I’d like to applaud you for the good good job you and your family have done over the years. How possible is it also, that your documentaries are aired on local Tv programmes? And even a bit on how to co exist with wildlife like you guys do even in your camps. I’d also like to ask for permission before hand. Since 11th August is World Elephant Day, I’ll be sharing your photos on Twitter and Facebook just as part of my own private Anti-Poaching and Pro Elephant campaign. I am really an Elephant girl, though Ive never actually seen a live one in my entire life. I’m looking forward to visiting The David Sheldrick Elephant Orphanage in Nairobi and adopting a calf soon. And waaiiit,… might you by any chance be the Saba mentioned in Kuki Gallmann’s book I Dreamed of Africa? That might be you!!! Wow!!! Yes it is! Kuki is a beloved friend of ours. Thank you for making the world aware of the plight of the elephants. I have watched nearly everything you have made, including Big Cat Diary, and always love learning from you. I recently watched a program “The Mind of a Giant”, and saw a bull elephant who knew that humans would kill him for his tusks. So, when he saw a human, he would turn and hide his tusks in a bush. It just proves that they are aware of themselves as individuals. And, I have always wondered what they are doing when they stand, quietly, for long periods of time. And learned that it is believed they are thinking. What incredible creatures!! I hope you and yours, and your wonderful father, are blessed. Thanks again for sharing elephants with the world. I first watched your show Lioness bonding with a baby Oryx calf . That episode made me to visit Samburu in 2011. I never miss watching any wildlife shows on NATGEO channels. I also watched your episodes in Samburu about Elephants and their social life. I am visiting Kenya in September for safari and wish I could meet you in Kenya :). Any chance you will be in Kenya during September 2016? I would like to work with you, I am also want be part of your Org. How did you get into this career? When i see your shows, I was hoping if i could be there too. Is that possible for someone with a BSc.Computer Science degree to get into these kinds of action? Because, I rather prefer to live in the real world than the virtual one. You are a tough lady, who loves the job you do. Can you help? The most important thing is to follow your heart. If you are passionate about Nature then there are way stop use your degree to help. Best of luck. Thank you Peter – animals have something very special about them. I am always stunned by the sheer diversity and beauty of the creatures with whom we share this Planet. Saba – this is a personal question. Did you ever photograph with David Attenboroug a lion which you guys called “Jason”? Not that I know of… do you know where the lion lived?? And what period of time? I am a retired oral and maxillofacial surgeon, and facial pain specialist, here in New York. The only wildlife I’ve ever experienced first-hand, outside of a zoo or nature preserve, has been working for many years in the vast wilds of Manhattan. So you can see how much I appreciate learning about all the wild animals of Africa from presenters like you, Simon, and Jonathan, on “Big Cat Diary”. I’m just writing to thank you for the wonderful job you always do on the show, which I watch five days a week. Your commentary is ever so sharp and insightful, warm and loving. Your affection for all the big cats, and your absolute devotion to their well being, is so very heartwarming, and so very contagious as well. Now that I’ve researched your background and your life, I see that you are also a wonderfully devoted daughter, wife, and Mommy. Being a Daddy to three lovely daughters, and Grandpa to eleven delicious kids, I appreciate that most of all. I just want to wish you much continued success with all your important animal preservation and public education work. May God grant you, Frank, and the kids many many years of life, love, and happiness together! I’m hoping to come to the States sometime in the near future to do the National Geographic lecture circuit. Perhaps we might even get to say hello in person. I have, what seems, a silly idea but the conversation “may” spark a solution. Am just an animal lover, no formal study, this is simply an outline. Hire the poachers, pay them a bit more than the bad guys do. Their job description is care for the animals/habitat (that they use to destroy). I see the poachers as humans, who live in a limiting society and not many choices for survival. Turn. them to good, There are MANY well known, large resources Americans who am sure would participate. ..not to mention ALL the money that flows into the animal protection funds now that can be used to pay the “new” good guys!!! Hope Iain and/or Saba get this idea. If anyone can make it work they can! This has been tried successfully in many places. Unfortunately, Africa is huge and the range of African elephants equally so. The scale of killing across the continent is massive. But small steps and working locally is how change begins. Hello Saba, I think we were on your camp, at least in the swimmingpool-area, in 2005. Staying with tents on a campsite next to the river near the lodge we were allowed to use the swimmingpool ! Just minutes ago saw you on TV over in NL, on Belgium 1. But it was nice to see, and bringing back fond memories !! Keep up the good work, Jan Pieper, NL. Hi Jan – I don’t think that was our Camp as we don’t have a pool! Welcome next time! I am a great fan of your work and find what you do and stand for truly inspirational. However I cannot help but think that with the ever growing human population in Africa the task of preserving nature and natural habitats will become more and more difficult. Would love to know your thoughts on that. Wishing you all the best and hope to see you in London in 2017! I must say you are very beautiful Saba. Take care. I would like to thank you for the marvelous things you and your husband are doing out there.Keep up the good work, you and your team are doing a wonderful and worth while job!! I’m following your adventures on TV here in Belgium (Europe) I like all the animals it’s a pity that the human’s kill them. Saba – do read this post if you have the time. How this elephant got shot by poachers but approached the vets for help. Absolutely beautiful. I got pregnant with our first child! Bit too bumpy in the Land Rover for a first time mother! Hi Jasmine – sorry but I’ve only just seen your message. AC was fantastic and best of luck with applying to the UWC’s. They’ll change your life! We hope this message finds you and all your loved ones (animals and people alike) well and in good health. We are fascinated by wildlife with my wife. We’ve watched so many documentaries and among those we’ve started watching (almost binge watching) your TV show. It’s amazing what your parents started and just so wonderful that you’ve followed in their steps. My father was a vet and I’ve always loved and respected animals. It just took us two episodes to decide we want to go to your camp and contribute in at least some way to your campaign on wildlife conservation. It stunned me to know that between 2011 and 2014 100k elephants were killed by poachers. It really broke my heart because they are such wonderful animals, so intelligent and social. We’ve also seen how hard conservationists like yourself, and those who rescue abandoned and orphaned baby elephants, work against that heartless market. My wife is Chinese and I am from Colombia, we live in China and are planning on moving to Australia next year but would definitely like to save money so that we can go meet you, your Kenyan staff and your elephants to give you all a big hug full of thanks and blessings for the mission you took in your lives. It might take us a couple of years to save enough money to go visit (moving countries is no cheap enterprise as you might know), but we will definitely go. How can we get more details on how get a quotation so we can start filling up the piggy bank? My email address is camandresjl@hotmail.com and my wife’s is 649597931@qq.com (just signed her up for your newsletter). With much love and respect for you and your loved ones we pray G-d blesses you and keep you all. Dear Saba, I have been reading about the extreme drought in Tsavo National Park. I thought this might interest you and many others: https://www.facebook.com/DavidAvocadoWolfe/videos/10153855162601512/. I’ve discovered your documentaries not long ago by chance and I really liked them. I’ve been going through a depression and seeing you with all that positive energy next to your family (of humans and of elephants) was the perfect distraction for me. You are such an inspiring person and it makes me really happy watching your adventures. Hopefully I will attend to one of your talks in the UK. Keep doing what you are doing because you are the best at it. I have followed your work and that of Save the Elephants for so many years and I’m madly frustrated to have to miss your 2017 UK Tour as I will be away for the entire time. Is there a chance you may extend the Tour with extra dates (hopefully) or will you plan to Tour again sometime soon? I’m based in South Wales and have been very fortunate to have experienced a number of safaris across Kenya and the Rift Valley after having worked with wild animals in the UK. Very best to you and your family. Hi Saba, We have never met but we do have a connection, sort of. I was living in Nanyuki in the 70’s and my neighbour was Sandy Field. One night Sandy’s store room caught fire. Inside the store were many written records of your father’s research. Poor Sandy was distraught. We all tried to get the fire under control but due to gas bottles also stored there we had to retreat. Very sorry we could not save more than we did. Oh no! What an awful incident. Glad nobody was hurt, but a shame about the papers. Ah well! Times have moved on. We miss Sandy who was killed in a plane crash many years ago. Wonderful man. I have just watched your series on Eden TV here in the UK. Looking at your amazing place I was wondering if you ever need people to help? I have no qualifications other than a past Nursing career… but would love to take some time out and be apart of your team for a period of time. I’m encouraged by your passion towards nature. This is the way to go if as human beings wish future generation to find earth worthy living in. Well, I’m a Kenyan whose professional background is in tourism/ conservation. I’ve worked for tour operators as a driver guide and conservation organization particularly African Wildlife foundation as a driver/field assistant. I would wish to work with you in an capacity that suites my qualification and passion. I kindly request you if you have some work that I do I’ll appreciate. My CV,certificates and testimonials are readily available on request. I wish you you well in your work. You are welcome Najma! Please email reservations@elephantwatchportfolio.com to make a booking. Thank you Michael – what a LOVELY message to receive to start off 2019 from a fellow Kenyan! Much appreciated. Yes, I’m a bit better on FB now!!! Although it meant being dragged kicking and screaming into the C21st by my friend Bernard Lesirin. It was all so confusing at first but I’ve kinda got the hand of it now! Much prefer instagram to FB though. Are you in the UK or Kenya? If in the UK, am doing as series of lectures in April that might be a nice link to home. And a very happy new year to you too! I’m based here at home in Kenya Saba, so I will not be able to catch up with your series of lectures in the UK this coming April. Not to worry though Saba, we will touch base here at home in Kenya one of these fine days, hopefully this year in 2019. We are of the same times Saba actually i.e. I am just one year older than you, though we grew up in different parts of Kenya. Didn’t we all? :-) Have a great weekend Saba, and I will make an effort to catch up with one of your series of lectures that you will conduct while here in Kenya. Is there a link and/or website where I can follow up on your Kenyan circuit of events/Kenyan programs, Saba? My name is Carlos Vicente Cordero, I am currently a student in the third year of Biology at the University of Navarra, Spain. I started my studies as a Biologist because of the passion and interest that nature arouses me. During the summer I try to do internships, because it is when I have more time available, to continue forming in what I like and what I want to dedicate in the near future. Documentaries of nature and photography is something that has always fascinated me and that to which I try to focus my professional life. I get in touch with you to make you reach my intentions to request practices for next summer and to communicate my interest in your work. I have been reading carefully your website and I find your work very interesting. I have no problem on mailing the curriculum or any other information require. Thank you very much in advance.